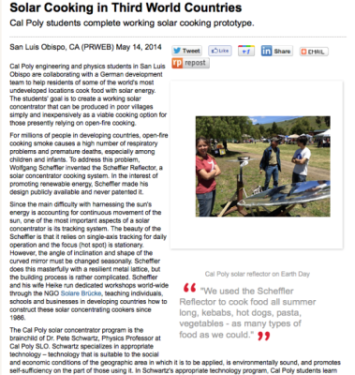 A unique program at Cal Poly SLO, headed by Dr. Pete Schwartz, is experimenting with ground-breaking solar cooking technology with its ultimate goal to make solar cooking an effective, affordable option for under-developed locations worldwide. Many villages in under-developed locations rely on open-fire cooking daily, which leads to respiratory problems and premature deaths, especially among children and infants. Notable German inventor Wolfgang Scheffler has pioneered solar cooking technology since the 1980’s and his free-to-the-public design was the basis for the Cal Poly prototype.